The larger 13-inch MacBook Air has also gained new flash memory that's twice as fast as before. The new MacBook Airs ship starting today. The 11-inch model starts at $899 for a 1.6 GHz dual-core Core i5 model with an Intel HD Graphics 6000 chip, 4 GB of RAM, and 128 GB of SSD storage. Doubling SSD space to 256 GB raises the cost to $1,099. The base 13-inch model is $999, and comes with specifications identical to its 11-inch counterpart. Likewise, bumping the computer's SSD to 256 GB costs an extra $200. The company did not, as previously rumored, update the Air with features like a Retina display and USB-C. Instead the company bestowed those features on a new, even thinner MacBook, based on a 1.3GHz Intel Core M processor. That product will actually be more costly than the Air, starting at $1,199. It will simultaneously drop many common MacBook features, such as DisplayPort and MagSafe connections. 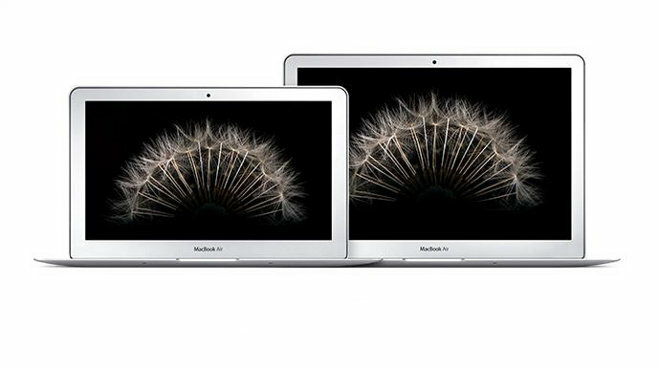 Apple's early-2015 MacBook Airs will begin arriving at Apple authorized resellers within the next 48 hours. Some base models are already listed in our Mac Price Guide, with dozens more configurations expected to be available at discount, with tax-savings benefits within the next few days.